This is a great idea. It encompasses several aspects, in a brilliantly simple way. 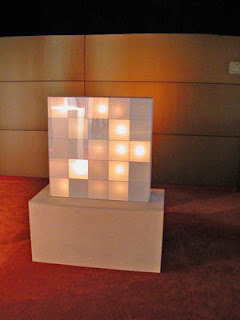 Tea light candles are placed in a grid, mimicking a digital screen. Each tea light is covered by a heat-operated switch - a can that has been cut into a fan, with one half cut away. As the Fan spins, the can alternately covers and uncovers the tea light, causing on-off states. First it takes the idea of the pixel and screen, and reduces it to the primitive. The concept of binary is still present, and it is exemplified by a random natural even, encompassing the idea of chaos. The artist invites the audience to make their own, and add it to the installation, even even leaves it open ended, so that it could continue to grow in a scalable fashion reminiscent of a fractal pattern. The Robot Chair, personification onto an object.